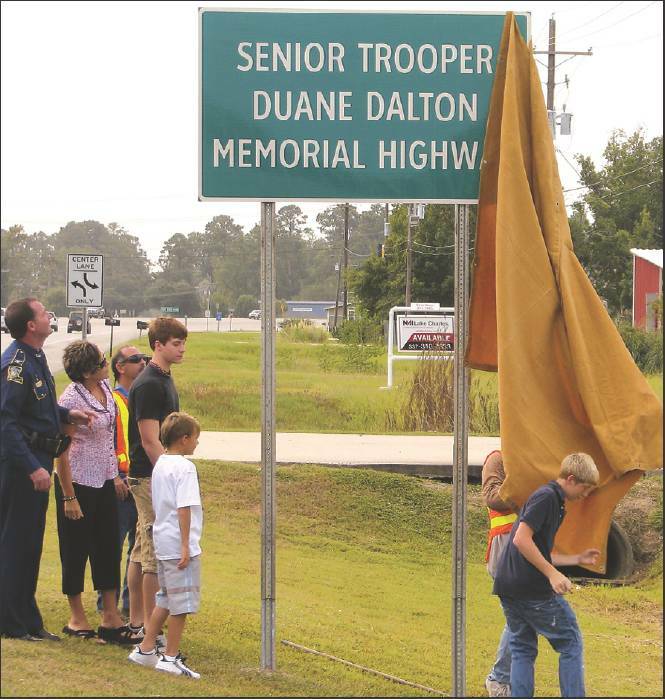 At a Monday ceremony dedicating a stretch of U.S. 171 to fallen state police Trooper Duane Dalton, his co-workers remembered him for his humor and willingness to help others. Dalton was killed in a Jan 12 on-duty accident on U.S.. 171. As his training officer, Trooper Josh Duhon described Dalton as a great teacher, using personal lessons he learned while on duty as a freshman trooper. “I have to say I learned more from him than any other FTO,” Duhon said. Lonkowski said Dalton “never ran across a strang–er.” “He tried to make everyone feel comfortable,” Lonkowski said. Trooper John Goodly described Dalton as a super nice guy who was quick to provide backup to other troopers on a call. Dalton was a native of Radford, Va., and came to Southwest Louisiana during his time in the Army. He worked for the Lake Charles Police Department before moving to state police, where he worked in gaming and patrol. “He liked the fact that he helped people, whether it be an arrest in a domestic disturbance or a traffic accident,” Duhon said. The one-mile stretch of U.S. 171 dedicated to Dalton runs from Sam Houston Jones Parkway to You Winn Road. The proclamation came about from a bill co-sponsored by State Rep. Brett Geymann, R-Moss Bluff, and Sen. Willie Mount, D-Lake Charles. His widow, Charissa, thanked the attendees for the dedication as well as the help she has received from them since her husband’s death. “The support has been overwhelming. They’ve all been there to help me with anything I’ve needed, from yard work to whatever. They’ve been there,” Charissa Dalton said. Local law enforcement officials on Wednesday shared their memories of State Police Senior Trooper Duane Dalton, who died Tuesday after a two-vehicle accident on U.S. 171 in Moss Bluff. Trooper Sal Messina, who worked with Dalton for 12 years, said he considered the man a good friend and someone who was fun to be around. Dalton, a native of Virginia, came to Louisiana while in the military. He met his wife here and settled. He was the father of three children, and he coached at baseball camps and headed to Baton Rouge for LSU games whenever he could. “That’s all he talked about — his family or baseball,” Messina said. As a senior trooper, he said, Dalton always tried to help other officers on the shift. Dalton began his law enforcement career with the Lake Charles Police Department in 1993. Sgt. Mark Kraus, one of his training officers, said he quickly noticed Dalton’s integrity and desire to protect people. To see a slideshow (BY BRAD K. PUCKETT) of Trooper Dalton’s funeral, CLICK HERE. Both Messina and Kraus noted Dalton’s sense of humor, which they said stood in contrast to his imposing 6-foot-4-inch figure. In 1995, Dalton joined the state police. In his 14 years as a trooper, he worked in the patrol and gaming divisions. Visitation will be 11 a.m.-10 p.m. Friday, Jan. 15, at Johnson Funeral Home and from 10 a.m. until his funeral at 2 p.m. Saturday, Jan 16, at Trinity Baptist Church. A Louisiana State Police trooper died at a local hospital Tuesday night as the result of a two-vehicle accident on U.S. 171 in Moss Bluff. Trooper Stephen LaFargue with Troop D confirmed a trooper was involved in an accident that occurred at around 7 p.m. LaFargue said the injured trooper had to be removed from the car with the jaws of life and was airlifted to Lake Charles Memorial Hospital, where he was pronounced dead. LaFargue would not release any other details of the accident late Tuesday.